Actually, I do know the seller, although we've never actually met. What a stunning looking instrument. I know nothing about these. If it had a square neck, I'd be all over it. Would it be a great sounding lap steel? I tried a metal bodied Brasher with an aluminum cone about 30 years ago that I recall as being quite nice. That one rings bells. I've previously seen peacocks on a Hensel/Brasher, but I can't recall when or where. Pardon me but forums are not something I'm used to doing however I think I have something that may be of some interest to some of you. In 1992 I bought a small music store from an older gentleman that I had previously worked for. At the time of purchase there was a bunch of "junk" in the back room that I told myself one day I would deal with. Well, I sold my business last year and I've decided to sort through that junkpile. 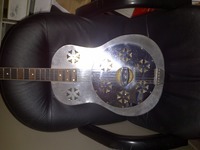 In it, I found an old home made looking resonator that I seem to remember a customer mentionning that it had been made in Ontario buy a person who hadn't made very many. So as I googled around I stumbled onto this site. 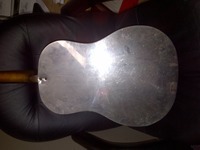 I beleive it may be a guitar from Charles Brasher. 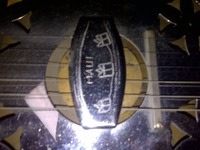 A maui. 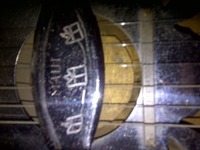 It says Maui on it engraved by hand. Not sure of much else, I can't even find his name on in it. 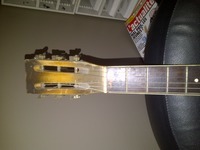 The model number is 558 which is stamped (engraved) on the tailpiece. It also has the patent pending 349662 bracket close to the center. 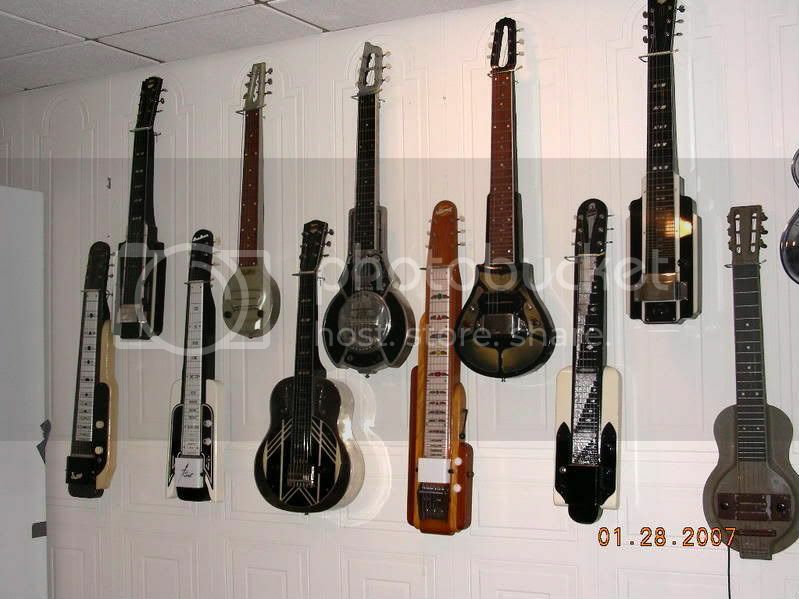 It is an all metal guitar but not as ornate and some of the ones I've seen on the notecannons site. Somewhat plain. What should I do with this? I think you should post some pics, and await advice. The easiest way to post is to upload them to photobucket etc, then copy the link directly into the img brackets after clicking on the 'picture' icon. Here is my first try to upload photos. Body by Ted (Charles Edward) Brasher; neck by Arthur Hensel; roofing nail repair on back by unknown.